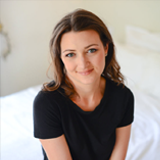 Creating a niche web store with WordPress has never been easier! Kidz Store is one of the best niche WordPress ecommerce themes. It’s designed to make online selling fast, easy and affordable. The theme comes built-in with awesome features for selling products and is even compatible with WooCommerce. Because of it’s quirky design it’s best used to create sites for selling toys and other products related to children. 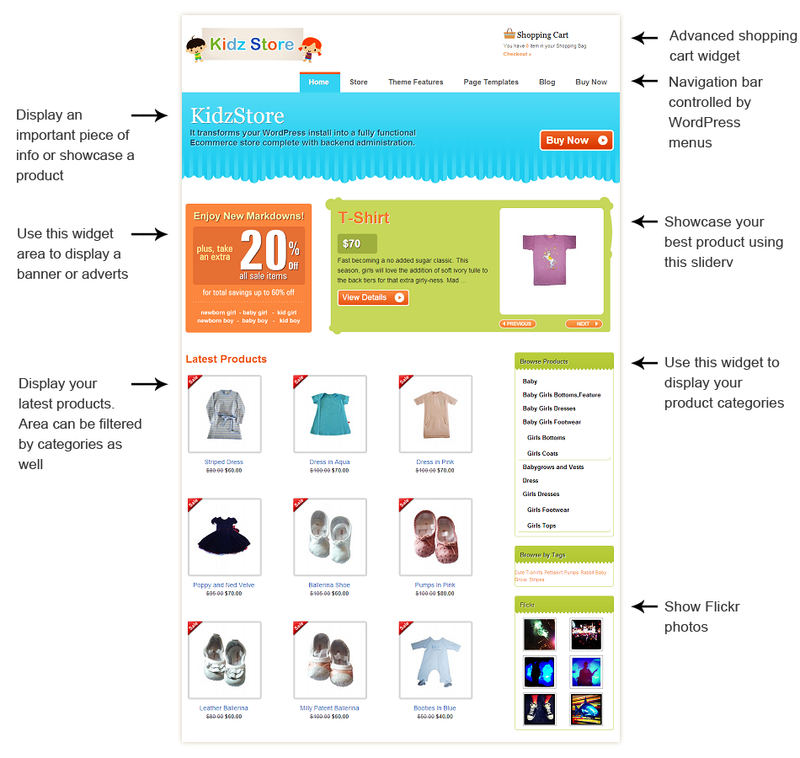 The beautiful Kidz Store homepage is created with a number of custom widgets. Swapping elements or including new ones is as easy as drag n’ drop, literally. Kidz Store comes bundled with several online and offline payment methods. Online include PayPal, 2Checkout and Google Wallet while offline include cash and PreBank transfer. 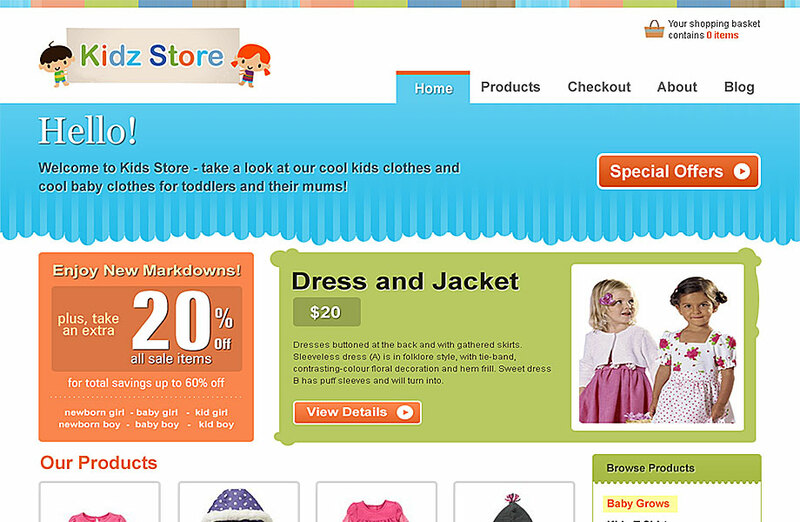 Kidz Store is one of the most versatile retail WordPress themes available today. You can use the theme to setup different types of stores. For example…Sell physical products such as clothes. Using attributes you can make each item of clothing available in multiple sizes or colors. The custom register form in Kidz Store is designed to gather more information about your buyers. Yes, it is. From the “Advanced Settings” section in the theme back-end you can upload .csv files containing property data. No, they cannot. Kidz Store is a classic e-commerce theme where only the admin (you) can add products. Right now the theme allows visitors to check out using the following gateways: PayPal, Google Checkout, 2CO (2Checkout), Authorize.net, Worldpay. Along with the above gateways the theme comes with two offline payment methods: PreBank Transfer and Cash. With which versions of WordPress is Kidz Store compatible? No, it’s not, Kidz Store will look the same on all devices. That said, browsers in latest operating systems won’t have problems with rendering your Kidz Store-powered website. How can I integrate a new payment gateway into Kidz Store? WooCommerce is a free e-commerce plugin you can use instead of the built-in shopping features mentioned earlier. Kidz Store has been designed to work great with both systems… use the one that works best for your needs.